Warm yourself by the campfire. Come sit for awhile under the old mesquite tree. Celebrate the love between a man and his faithful equestrian companions. Take pleasure from inspirational stories and poems that offer a tenderhearted look at the joy of a life lived with horses. These gentle and noble animals are just like people in temperament and personality...and the training of a horse can teach valuable life lessons. So saddle up! 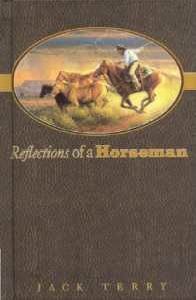 Come along for a ride...and consider the reflections of a horseman.